— 9/11 hijackers and Saudi citizens (15 of the 19 hijackers were Saudis) Khalid Al-Midhar and Nawaq Al Hamzi met in San Diego with several other Saudis, including one who may have been a Saudi intelligence agent and another who was both an al Qaeda sympathizer and an employee of the Saudi Consulate in Los Angeles. — The 28 pages may include speculation that the Saudi Ministry of Islamic Affairs funded mosques and other locations in the U.S. used by al Qaeda as meeting places and for recruitment. — The rumors that Saudi charities and/or the spouse of then-Saudi ambassador to the United States Bandar bin Sultan (who went on to be director general of the Saudi Intelligence Agency from 2012 to 2014) directly funded the 9/11 hijackers per se are “overblown,” according to Clarke. However, elements of Saudi charities and the ambassador himself did regularly provide funding to various Saudi citizens in the United States, for example, those needing money for medical care. 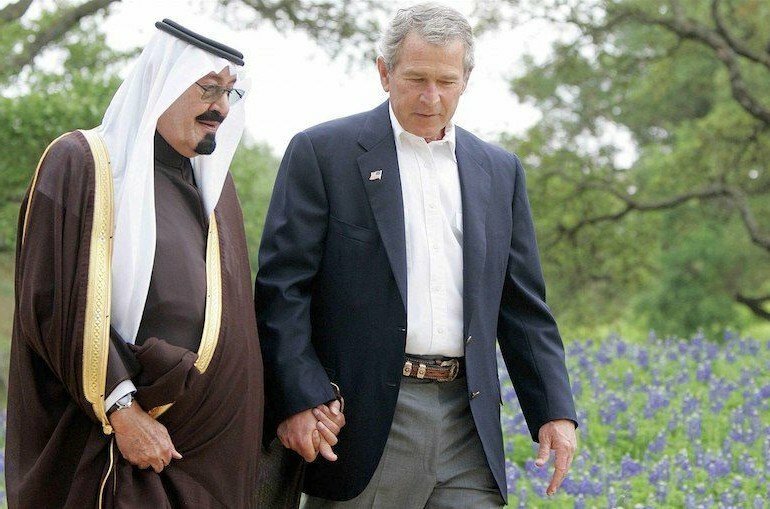 It is possible that the 9/11 hijackers defrauded Saudi sources to obtain funds, but less clear that any Saudi government official knowingly funded persons for the purpose of committing 9/11. Alongside Clapper, Clarke too believes the 28 pages will be released to the public within the next five to six weeks. Others have suggested more clear ties between the hijackers and the Saudis, including multiple pre-9/11 phone calls between one of the hijackers’ handlers in San Diego and the Saudi Embassy, and the transfer of some $130,000 from Bandar’s family checking account to yet another of the hijackers’ Saudi handlers in San Diego. Should the full 28 pages be released, there will no doubt be enormous emphasis placed on what they say, specifically the degree to which they implicate elements of Saudi Arabia and/or the Saudi royal family in funding or supporting the 9/11 hijackers. If the CIA contact with some of the hijackers is confirmed, that will be explosive. But as pointed out in Oliver Stone’s movie JFK (below), after the what is the why, and that answer has the potential to affect the future, not just document the past. — Why were the pages classified in the first place (who benefited?) and why did they stay classified now into a second administration, some 15 years after the events they discuss took place? — Why did the United States allow officials of the Saudi Ministry of Islamic Affairs to work in the U.S. under diplomatic status? That Ministry’s existence goes back to the 1991 Gulf War. The presence of American troops in Saudi Arabia was a shattering event in the country’s history, calling into question the bargain between the royal family and the Wahhabi clerics, whose blessing allows the Saud family to rule. In 1992, a group of the country’s most prominent religious leaders issued the Memorandum of Advice, which implicitly threatened a clerical coup. Only one official in the Ministry of Islamic Affairs inside the U.S., Fahad al-Thumairy, was stripped of his diplomatic visa and deported because of suspected ties to terrorists. That was in 2002. — Why does the U.S. still allow allow officials of the Saudi Ministry of Islamic Affairs to work in the U.S. under diplomatic status? — Why did the American government not arrest Omar al-Bayoumi, a Saudi national and employee of the Saudi aviation-services company Dallah Avco. Although he drew a salary, according to the New Yorker he apparently never did any actual work for the company during the seven years he spent in America. Bayoumi was in frequent contact with the Saudi Embassy and with the consulate in Los Angeles; he was widely considered in the Arab expat community to be a Saudi spy, though the Saudi government has denied that he was. — Why did the CIA not reveal its contacts with the two 9/11 hijackers? Who benefited?